The Innovative Young Minds (IYM) programme is designed to encourage young women to explore science, technology, engineering, mathematics and high-tech manufacturing - fields we call the STEMM sector. The week-long residential programme is open to female Year 11 and Year 12 students in the Greater Wellington region, and runs during the July school holidays each year. The programme is only open to young women, because females are under-represented in the STEMM sector and we want to change that. Increasing female participation in STEMM will mean greater innovation and economic success for everyone. Run jointly by Rotary Hutt City and Hutt City Council, the goal is to inspire young women to consider careers they may not even know exist by interacting with the diverse STEMM businesses, research organisations and education providers that our region is known for! Tracy Brown, Chair of the RCW Youth Committee was delighted to be able to attend the Parliamentary reception on 12 July for the 2018 IYM programme. 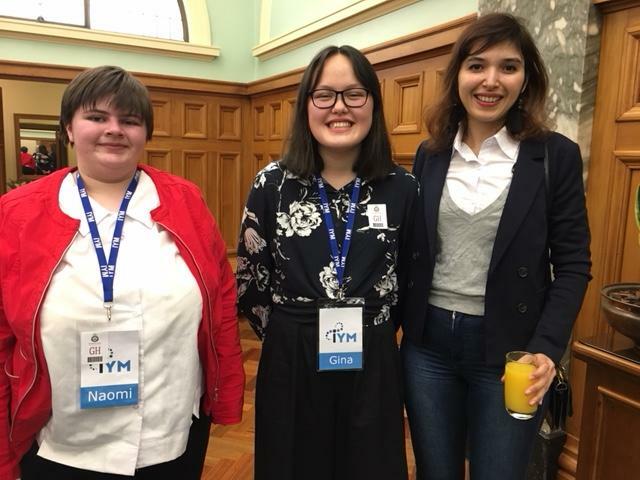 Naomi Pledger and Gina Dao-McLay, both students at St Mary's College attended IYM 2018 this week thanks to grants from the Rotary Club of Wellington. At the reception, Naomi and Gina chatted with Farzana Masouleh, a Research Scientist at Measurements and Standards. Farzana and the many other scientists and business people who gave their time have provided the students with a great introduction to science 'in action' - and all on our doorstep! Original generation time 1.9583 seconds. Cache Loaded in: 0.0544 seconds.